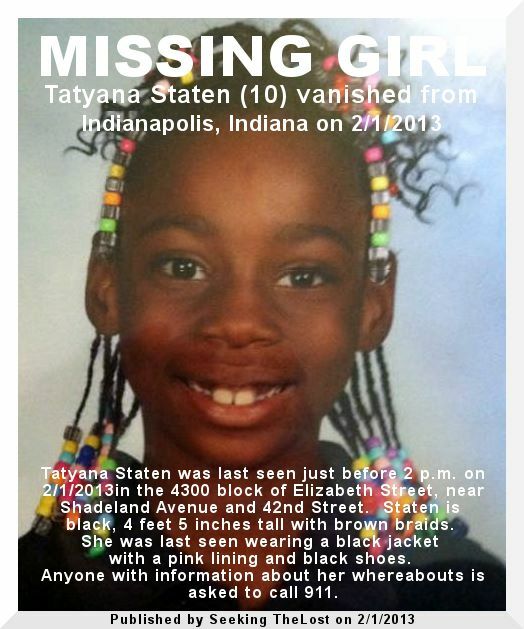 Police received a call around 10 a.m. Sunday morning that Tatyana had been found. A neighbor saw Tatyana at the Kroger near 46th and Shadeland and called her name, and she answered, police say. Doctors are currently checking Tatyana out for hypothermia at Community East Hospital. Tatyana Staten was last seen around 2p.m. on Feb 1, 2013 in the 4300 block of Elizabeth Street near Shadeland Avenue and 42nd Street. She was wearing a black jacket with pink lining, and black shoes.